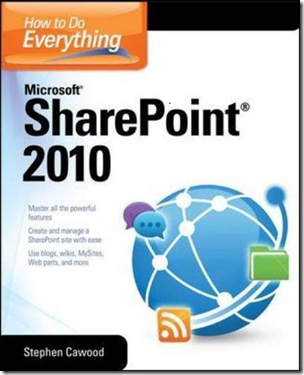 I’m thrilled to announce that my latest book project is an end-user SharePoint 2010 book called How to Do Everything: Microsoft SharePoint 2010. My good friend, Arpan Shah, Microsoft Director of Technical Product Management for SharePoint, has contributed a section on the history of SharePoint and also written the foreword. What I tried to do in this book is focus on the most important cases for the day-to-day user, but also provide an insight into power user and administrative tasks. With only ~315 pages, there’s only so much that I could cover. I trust readers are conscious of the fact that the “How to Do Everything” series name doesn’t mean that all of SharePoint can be summed up in one book. This book is squarely focused at the end-user. The publisher is McGraw-Hill Osborne Media and I’m excited to be working with them again. The book will be on shelves this summer. However, you can order your copy today from the Amazon and McGraw-Hill sites. Congrats Steve. Consider me pre-ordered.